Our tour group consisted of the members of Mr. Damiran Gonchig, Mr. Amarsanaa Gonchig, Mr. Gansukh Damiran and Mrs. Tsermaa Gonchig’s families and we left Uliastai, Zavkhan at 09:00 am on August 13, 2010 in order to locate confluence point 49N, 98E with Toyota Land Cruiser and Nissan Terano. We went about 180.6 km through the local road and at 14:30 o’clock, we stopped about 580 m away from the confluence point 49N, 98E, because road was impossible to go with the cars. We walked to the confluence point from there and about 15:05 we found the 49N, 98E point with Garman V GPS. Confluence point 49N, 98E was located around 181km from Uliastai, Zavkhan, 51km from the Tosontsengel, Zavkhan and 898km from the capital city Ulaanbaatar. 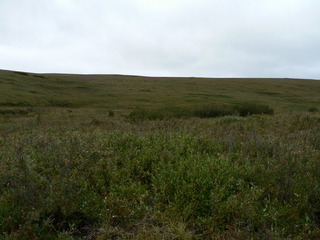 Point was in middle of marsh next to the Sogoot Mountain. We took pictures of all four directions as well as GPS for confirming the point and as well as the members of the group. Mr. G.Damiran’s family consisted of Mrs. U.Lkhagvasuren and Mr. R.Munkhbaatar. Mr. D.Gansukh’s family composed of Mrs. S.Odonchimeg, Mr. G.Enkhtaivan, Ms. G.Maral (6 years old), Ms. G.Narangoo (2 years old) and Mr. S.Munkh-Od. Mr. G.Amarsanaa’s family made up of Mrs. S.Altantuya and Ms. A.Ashidjargal. Mrs. G.Tsermaa’s family consisted of Ms. N.Battsetseg (7 years old).